For full ad. specifications, please click here. 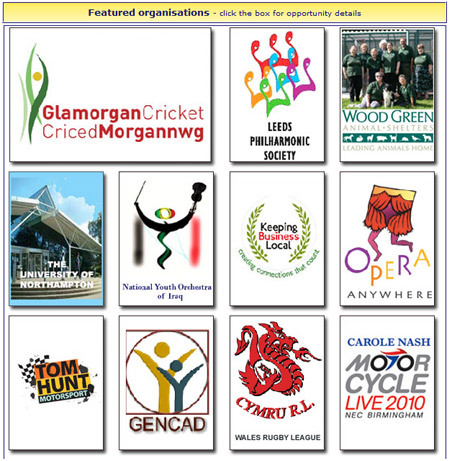 For information about listing a sponsorship opportunity, please click here. Richard Fox: +44 (1) 354 740916. PayPal allows you to use your credit card from anywhere in the world to pay us instantly, even if you haven't got a PayPal account. When we send you an invoice, we include in the email a link to a PayPal page via which you can make the payment, using any of these currencies: Canadian Dollars, Euros, Pounds Sterling, US Dollars, Yen, Australian Dollars, New Zealand Dollars, Swiss Francs, Hong Kong Dollars, Singapore Dollars, Swedish Krona, Danish Krone, Polish Zloty, Norwegian Krone, Hungarian Forint or Czech Koruna. Positions in The Australasian Sponsorship Database available for full banners: top of Home page, foot of Home page, top/foot of Category Home pages, run-of-category, run-of-site. 'Categories' means Arts, Cause-related, Education, Media, Sport, Other, Showcase.